Lace tulle, a striking floral pattern with Blacks, Gold and White with iridescent Black and Gold Embroidery and Sequin. Heavy weight, sheer, drape, slight 2-way stretch, a wonderful quality, 50″ wide. 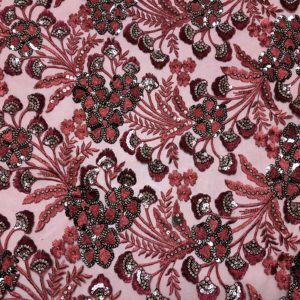 Perfect for formal wear, a gown, dress, top or light weight jacket.